Cantlos are a song and instrumental duo specialising in the traditional songs of the British Isles and Ireland, with an emphasis on those from the Celtic cultures within these islands. 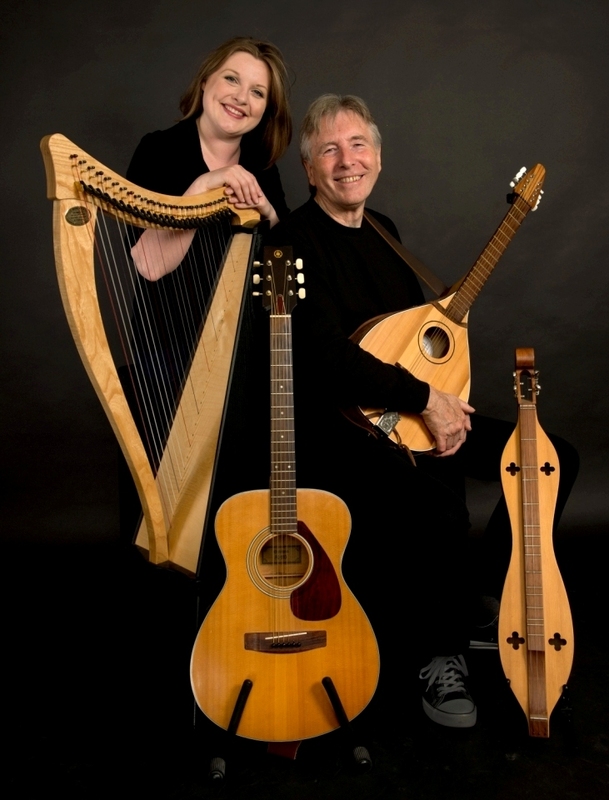 Cantlos are Kirsty Morris and James McCafferty and play Celtic harp, cittern, dulcimer, guitar, melodeon, bodhran and keyboards. Cantlos are available for weddings, celebrations, concerts and festivals. Their repertoire spans more than five centuries of song, including medieval carols, Elizabethan tavern songs, folk music and contemporary songs within the folkroots and Celtic traditions. Share an evening with Cantlos and discover for yourself the mystery and magic of songs evoked by the Celtic heartlands. Such a nice morning in Buckingham town centre today, singing and playing carols and festive music on the guitar and melodeon - though the temperature was a tad chilly on the fingers! Thank you, lovely people of Buckingham, for your kindness and generosity. It was a special privilege to sing "The Boar's Head Carol" with Mo (pictured in one of the photos), who is blind - it's one of her favourites. Thank you, Jeremy Parkin, for the coffee - though, please note, he stayed in the warm in the wonderful Gyre & Gimble coffee shop while I was playing! And thank you, too, to Ruth and Graham Holiday for the tea in Gazzeria in Meadow Walk afterwards. Big thanks to Buckingham Town Council and its mayor Jon Harvey, who are a thoroughly enlightened authority and welcome street musicians. So, depending on the weather, you might find me outside Waitrose again next week! On tonight, for anyone near Buckingham.You might have caught a glimpse of our post a couple of weeks or so ago, and it's December already! So this is just a quick reminder about our upcoming concert Christmas Carols with Cantlos at The Radcliffe Centre in Buckingham at 7.00pm on THURSDAY 6th DECEMBER. If you're a fan of Christmas music, join Kirsty and James on Thursday for a feast of traditional carols - some very familiar, others less well known, but most with a Celtic flavour. Refreshments by Buckingham WI. You might have caught a glimpse of our post a couple of weeks or so ago, and it's December already! So this is just a quick reminder about our upcoming concert Christmas Carols with Cantlos at The Radcliffe Centre in Buckingham at 7.00pm on THURSDAY 6th DECEMBER. If you're a fan of Christmas music, join Kirsty and James on Thursday for a feast of traditional carols - some very familiar, others less well known, but most with a Celtic flavour. Refreshments by Buckingham WI. These remote tribes from around the world have never seen Morris Dancing before. Just a few days to go now before our concert of songs and music from the British Isles and Ireland at 7.00 pm on SATURDAY 15 SEPTEMBER in the St Laurence Room in Market Square, Winslow MK18 3AB. We hope it'll be a feast of the traditional folk songs many of us can remember singing in primary school with the BBC's wonderful Singing Together schools radio programme. Doors open at 6.30 pm. Refreshments before the concert and during the interval are in the very capable hands of the Winslow EarlyBirds WI, so we know the cakes will be fabulous! Advance tickets are £5 cash from Costume Crazy Fancy Dress, 76b High Street, Winslow MK18 3DQ (01296 712728) or online from www.cantlos.com/buy-concert-tickets. £8 cash on the door.